UT Assistant Professor of Musicology and CAM board member, Dr. Hannah Lewis, has a new book published by Oxford University Press: ‘French Musical Culture and the Coming of Sound Cinema’. Description from Oxford Press: the transition from silent to synchronized sound film was one of the most dramatic transformations in cinema’s history, as it radically changed the technology, practices, and aesthetics of filmmaking within a few short years. In France, debates about sound cinema were fierce and widespread. 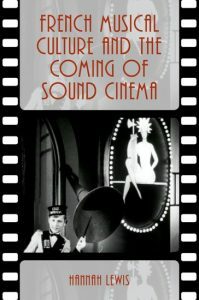 In French Musical Culture and the Coming of Sound Cinema, author Hannah Lewis argues that the debates about sound film resonated deeply within French musical culture of the early 1930s, and conversely, that discourses surrounding a range of French musical styles and genres shaped audiovisual cinematic experiments during the transition to sound. Complete info from the publisher’s website here.